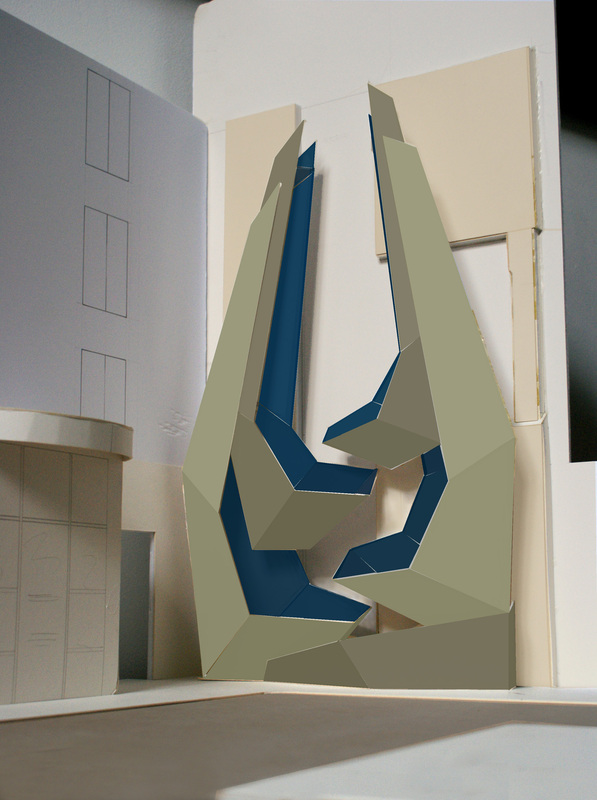 The sculpture will be made from mild steel. Originally we wanted to use corten steel as used for many of Neil’s mentor, Sir Antony Caro’s sculptures. However, our budget won’t run to that… Neil came up with the perfect answer though… a robust paint process over the cheaper mild steel. Using several layers, this process creates a perfectly smooth and vivid finish similar to that of a car, except our colours will all have a matt finish. In making our choices, first we had to consider what the sculpture actually does: it provides a home for plants. Any colours that camouflage or take attention away from the plants were a no no. Then, the light… the site faces west so the colours have to work in both full shade and full sun as the day progresses and the sun passes overhead. Being appropriate to the site is essential, the sculpture must enhance the area and be livable with. I was really happy that Prussian blue was chosen for the inside sections of the sculpture. Being an avid garden programme watcher I know how much TV garden designer Diarmuid Gavin emphasises the importance of using blue in our gardens as it reacts extremely well against our northern hemisphere quality of light and gives plants a fantastic backdrop against which greens really shine. For the outside, colours which exactly match the Georgian terrace houses opposite were selected. This will unify the street, giving a lovely sense of shared open space. Two muted greens were chosen you can see these on the walls of numbers 31 and 33 Wharfdale Road. Finally, one colour was chosen to pick out the slightly protruding parts of the wall itself. It’s a muted stone colour (less creamy than it looks here) and again, will exactly match the colour palette used opposite on the wall of 29 Wharfdale Road. The colours here are all approximations as it’s impossible to recreate them exactly on screen. Each pod will be fitted with a hidden removable planter. This decreases the weight of soil needed and protects the sculpture itself. Drainage flows from pod to pod and then out through the foundation of the sculpture. Each planter will be irrigated below soil level to decrease the amount of water needed whilst getting that water directly to plant roots. The two top pods will house non-self clinging climbing plants. An irregular trellis of steel wire will force the climbers up the inside of the sculpture ‘arms’. Over time they will cascade almost fountain like between the two arms of the sculpture. Behind the trellis in the arms of the sculpture will be fitted a series of hooks so that we can fit various nesting boxes to encourage birds. In the very top of the two arms of the sculpture we will fit hidden wooden bat hotels complete with internal perches for them to cling to. Bats prefer their homes at a great height so these will hopefully be attractive to them. The base of the sculpture will be made from cast concrete and the edges sealed to prevent any unwanted seeds setting and weeds growing up in difficult to reach places. Solar powered subtle spotlights will be fitted into each pod to act as up-lighters through the planting. There’s still a little time for you to give us any comments on this project you’d like. We are aiming to get our planning application into the council by the end of next week (fingers crossed! ).